One of the funniest films ever made, Airplane! mocks the 1970s airplane disaster movie with a relentless stream of comedy mayhem designed to expose Hollywood‘s contrived plot devices. This must-see classic helped pioneer the spoof genre started by Mel Brooks. 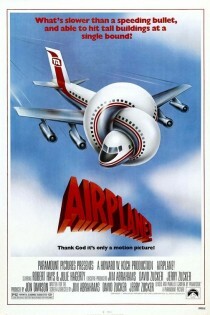 With Airplane!, the writers and directors created a barrage of silly, bizarre and absurd word plays and jokes which still work well to this day. The chaos is played out with hilarious deadpan deliveries by the likes of Leslie Nielsen and Lloyd Bridges. Surely you can’t be serious!! A movie which brought a few old school Hollywood stalwarts like Lloyd Bridges, Peter Graves, Robert Stack and Leslie Nielsen to a new generation, besides all of the brilliant visual and verbal gags. Completely un-PC, its like could never be done again. A landmark comedy in so many ways. So many after school evenings watching this film. My already watched, they laughed but not as much as I did.